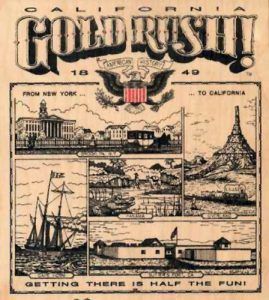 San Francisco was not inclined to accept the reports of gold discoveries. Bancroft says a few men slipped out of town to investigate for themselves, keeping their movements quiet as if fearing ridicule. Presently several well-laden diggers arrived bringing bottles, tin cans, and buckskin bags filled with the precious metal. “Sam Brannan, holding in one hand a bottle of gold dust and swinging his hat with the other, passed along the street shouting: ‘Gold! Gold! 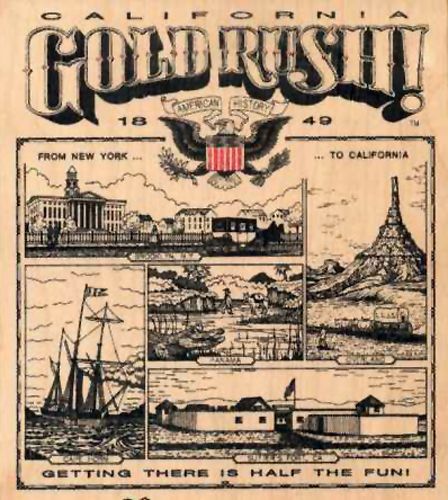 Gold from the American River.” The excitement was prodigious and in a few days the exodus had begun. By boat, by mule and horse, or on foot they went, all eager to reach the mines, fearful that the gold would be gone before they could get there and receive their share. Business houses closed their doors. There was no service in the little church on the plaza and a padlock was on the door of the alcalde’s office. The ships in the harbor were deserted alike by masters and sailors. Soldiers deserted their posts and fled, taking their arms, horses, blankets, etc., with them; others were sent after them to force them back to duty and all, pursuers and pursued, went to the mines together. General Sherman, then lieutenant of 3d artillery, tells how he organized a force of seven officers to pursue and bring back twenty-eight men of the 2d Infantry who had deserted in a body taking their arms and accoutrements. They captured and brought in twenty-seven of them. On the 25th of July, 1848, Governor Mason issued a proclamation which recited the fact that many citizens had gone to the gold mines without making proper provision for the families they had left behind; that many soldiers, tempted by the flattering prospects of sudden wealth had deserted their colors to go to the same region, regardless of their oaths and obligations to the government, thus endangering the safety of the garrison; and he declared that unless families were guarded and provided for by their natural protectors, and unless citizens lent their aid to prevent desertions, the military force in California would concentrate in the gold region, take military possession of the mining district, and exclude there from all unlicensed persons. All citizens employing or harboring deserters would be arrested, tried by military commissions, and punished according to the articles of war. Let us see what military force the governor had at command to enforce his decrees. 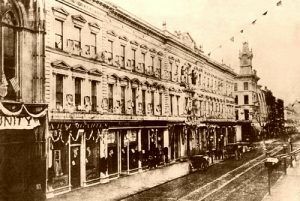 Twelve days after issuing the foregoing proclamation the governor received notice of the ratification of the treaty of peace between the United States and Mexico and he at once ordered the New York volunteers — Stevenson’s regiment — mustered out, their term of service ending with the war. The Mormon battalion had been previously mustered out on expiration of their term of service. This left the commander but two companies of regular troops, viz: F company, 3d artillery, numbering sixty-two officers and men, and C company, 1st dragoons, eighty-three, a total in California of one hundred and forty-five soldiers, with the ranks being depleted daily by desertions, and not a warship on the coast of the province. The governor, without the machinery of civil government, with no civil officers save the few alcaldes he had appointed, and unsustained by adequate military force, was compelled to exercise control and maintain order in a country extending over six hundred miles in length by two hundred in width, over a community composed of about equal numbers of Californians and foreigners, the latter largely made up of runaway sailors and men accustomed to a lawless life, jealous of each other and of the Californians, all wrought up to an intensity of excitement by the gold discoveries, and now increased by a thousand soldiers discharged without pay. It was a case requiring skill, judgment, and determination. All the complex responsibilities of a civil administration thrust upon a military commander, without council or legislative support, were to be met and the honor of the United States government maintained. The trial of criminals, the establishment of port duties, the registration of vessels, the making of custom house regulations, the examination of ship’s papers, the collection of duties, the appointment of collectors, alcaldes, judges, etc., the prevention of smuggling, represent a few of the responsibilities of the governor. On August 14, 1848, Major Hardie wrote the governor from San Francisco that the deficiency of force to support the civil organization at that place was likely to be productive of the most serious consequences. That the lower classes of the community were of the most lawless kind, and when their ranks were swelled by disbanded volunteers, freed from the restraints of discipline, there would be no security for life or property. Captain Folsom, assistant quartermaster, wrote the same day that acts of disgraceful violence were of almost daily occurrence on board the shipping in the harbor and the officials had no power to preserve order; that his “office is left with a large amount of money and gold dust in it, and the volunteers are discharged without pay.” “We collect port charges, etc.,” he writes, “from both foreign and American vessels, and in return we are under the most imperative obligation to protect trade.” It is not to be wondered at that Mason, as colonel of 1st dragoons, applied to the War Department November 24, 1848, to be ordered home, having been absent from the United States for two years. In addition to the outrages committed by lawless men, the disbanding of the Mormon battalion and the Stevenson regiment, together with the absence at the mines of a large portion of the citizens, left the country defenseless against inroads of hostile Indians. In the attempt to stay the desertion of his men Colonel Mason granted furloughs permitting them to go to the gold fields for periods of two or three months. These soldiers met with varying degrees of success. One of them, private John K. Haggerty, of F company, 3d artillery, came back from the mines with sixty pounds of gold ($15,000). Throughout the Americas and Europe the most astonishing reports were received from the gold fields of California. General Smith writing from Panama January 7, 1849, says that none of the accounts received were exaggerated; that there had been brought to Valparaiso and Lima before the end of 1848, gold valued at $1,800,000; that the British consul at Panama had forwarded 15,000 ounces. ($240,000) across the isthmus, and that the commander of the Pandora, Royal Navy, informed him that the truth was beyond the accounts he had heard. General Smith was also informed that hundreds of people from the west coast of South America were embarking for the gold fields. In a subsequent letter he says that he has learned from many sources that there was a great emigration of people of all nations to California and that many are going off with large quantities of gold. He says that on his arrival there he shall consider every one, not a citizen of the United States, who enters on public land and digs for gold, as a trespasser and shall so treat him. 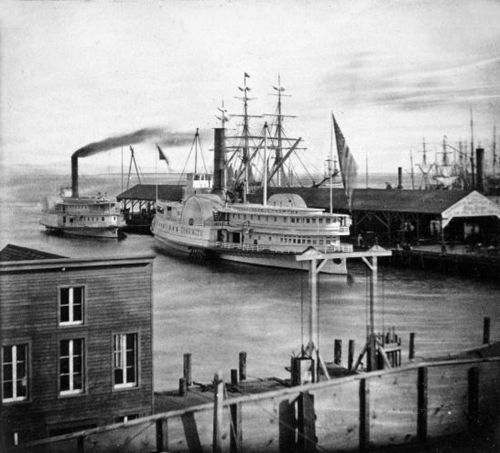 On the 12th of April 1848, the Pacific Mail was incorporated with a capital of five hundred thousand dollars, and contracts were entered into for the building of three steamers; theCalifornia, 1050 tons, the Oregon, 1099 tons, and the Panama, 1087 tons, the California was completed first and sailed from New York October 6, 1848, under command of Cleveland Forbes. She carried no passengers for California. Meanwhile the reports from California of the extent of the gold fields, and the marvelous quantities of the metal obtained by men unskilled in mining and without capital were received in the eastern states and in Europe. In November 1848 came Lieutenant Loeser of the 3d artillery, with dispatches from the military governor of California, confirming the most extravagant reports from the gold fields, and bringing tangible evidence in the shape of a box filled with gold dust. The gold was placed on exhibition at the war office and the president embodied Mason’s report in his message to congress December 5th. The entire community went wild with excitement. Mason’s report with the president’s endorsement was published in the principal newspapers throughout the world. The “gold fever” was on and from all parts of the world companies were fitting out for California. From Sonora in Mexico, thousands of men came overland, while from the coasts of Chili and Peru as many more came by sea.